I would not have admitted this even a year ago, but now I finally agree that some quilts can't be saved, at least not in their original form. Until recently, I completely rejected the idea of cutting up perfectly good quilts to make book covers and handbags, but I did allow some leeway for repurposing quilts if they already had holes in them. My opinion was that, with a lot of patient work, nearly every quilt could be repaired and put back into service. I admit that I don't mind a certain primitive, organic quality in quilts. A few puckers? No problem, just stitch them down. Pieced or mismatched alternating blocks? Hey, who hasn't miscalculated and run out of fabric and had to piece together a block or two? Fabric turned the wrong way around? Some people do this on purpose, just for effect. You see, it takes a lot for me to reject someone's workmanship. 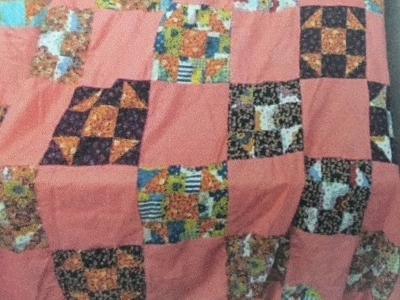 The vintage quilt top that changed my mind was an interesting looking churn dash pattern that was made of small print fabrics and arranged in a checkerboard style alternating with salmon pink blocks. I bought it online, where it was described as a "hand-sewn quilt project." In retrospect, the word project should have been a warning to me. When the quilt arrived, the main problem at first glance was that it was not perfectly rectangular and this was (at second glance) because the blocks themselves were not square. I mean really, really not square. There was no way that this quilt top could be made to lie flat so that I could pin it to a backing for quilting. For the first time, I decided to deconstruct a quilt down to the block stage. It was intended to be limited destruction. I would take apart the seams, cut the blocks so they were square and then stitch them back together in the same order in which they had been sewn before. The quilt blocks were not square. Then I made the first few cuts on the pieced blocks and realized (not suddenly, because I had already cut three of them) that the blocks were sewn by hand and I had just cut off the knots that held the pieces together. 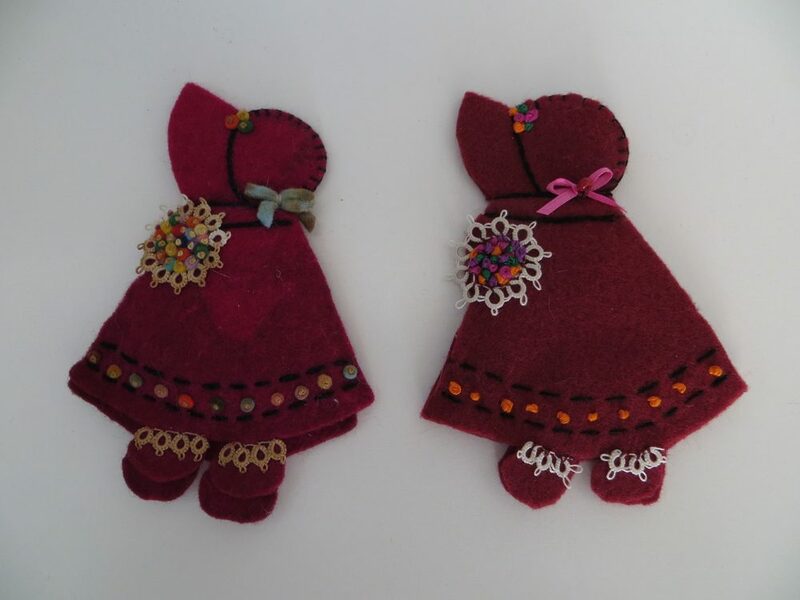 Moreover, they were badly sewn, meaning with really large stitches, and there were puckers -- lots and lots of puckers. New dilemma: do I take the time to re-sew all these blocks by hand? I couldn't do the stitching on the machine because not all the seams lined up and they weren't turned the same direction. Is it time to dump the entire project and just use the pieces to patch other quilts of that era? Then I remembered that something attracted me to this quilt in the first place, although now I can't quite remember what that was. Online, the photo made the salmon pink look more like the vintage bubblegum pink that I adore. I liked many of the fabrics, although some of the pairings within the blocks were a little busy. And what could possibly be more endearing than having the back of the fabric showing instead of the front in a couple of places? I like this kind of idiosyncrasy. Then, while paging through old quilt magazines in preparation for donating them to the Quilt Guild, I read an article about a woman who cut up vintage blocks and used them as the basis for her modern quilts. Blasphemy, I might have cried when the magazine was current, but now I am intrigued. This quilt top deserves to be saved, but now I knew that it wouldn't be in the same form in which it arrived. If the pieced blocks were repurposed as appliqué pieces, then I wouldn't have to worry so much about the integrity of the original stitching. I zigzagged across all of the seams on the blocks, thereby hammering down the puckers and reinforcing those handmade stitches. Did I mention that there are 50 pieced blocks? This took half a day of sewing. I started to feel excited, though, thinking of ways to create a new quilt out of old pieces. Using the Go Big Circles die made by Accuquilt, I cut the pieced blocks into big circles and appliquéd them onto various colored background fabrics. I chose a new alternating fabric with a cool tone because I thought it might complement some of the fabric choices in the pieced blocks. The original quilt top measured 72 by 82 inches and the final quilt is 92 by 92 inches. It doesn't look at all like the original, which makes me kind of sad. However, it is a pretty quilt in its own right and retains a retro flavor courtesy of the vintage pieced appliqué blocks. If you haven’t been hanging out at the local animal shelter lately, there is some terminology that you need to know to understand this post. Rescue: when the shelter takes in an animal and someone adopts it, the animal has been rescued. Forever Home: this term reminds us that the shelter is not a home, it is temporary housing. When the animal is adopted, it moves into a forever home. Foster: people who aren’t ready to commit to an adoption sometimes try out the pet for a limited time at home. Alternatively, foster caregivers sometimes care for kittens and pups or for sick or elderly pets who are too nervous, too ill or too young to stay at the shelter. Foster Fail: the foster fail is actually a success story. When foster caregivers fall in love with the pet in their care and decide to go ahead and adopt it, then it is considered a foster fail, but it is also an adoption success. This quilt top was rescued from a secondhand store in Indiana. So what is a quilt rescue? In the same way that shelter animals are given a second chance, I collect abandoned quilt tops, complete them and find them forever homes. I have had to accept that I will never really know the story behind the unfinished quilts that I find. I imagine that the maker’s heirs found them stored in trunks in the attic or maybe the maker tired of a project before it was quite done and packed it away. Perhaps the quilt top was passed on to someone who had no knowledge of or interest in how to finish it. The most that I usually know is a location where the quilt was found and maybe an estimate of the age of the fabrics or the era in which that type of quilt was popular. Only once did I find a note pinned to a quilt, “Your mother pieced this quilt in 1939, just before she died.” How did this quilt ever get separated from its family? How did any of these quilt tops end up in secondhand stores, antique shops, yard sales or on eBay? Each quilt does have an unwritten story, though, and this is usually a challenge that I have to overcome in order to finish the quilt. For example, one beautiful quilt had been marked for quilting with nice, dark pencil lines – on an off-white background. Since I can’t remove the marks, I will have to follow them very carefully when I quilt the top. Another white and yellow quilt was sewn with purple thread that would show through unless all the ends were carefully trimmed on the back. A gorgeous appliqued quilt was stained with ink and I had to cover the stains with additional appliques. Fortunately, many of these challenges can be overcome to an extent that the beauty of the maker’s craftsmanship still shows through. While some would argue that finishing the quilt removes a portion of its value, I ask myself: how much value is there to a quilt left to languish in the attic when it could be completed, used and appreciated? I have heard it said that no one leaves behind an empty inbox and I know that someday I will leave behind unfinished projects of my own. I can’t imagine a better show of kindness than for someone to come along and finish my work. These are the steps that I take to rescue a quilt: I clean the quilt top and try to remove any stains. Once it has air-dried, I check the integrity of the stitching and reinforce any seams that might have failed. Sometimes I add a border of coordinating fabric to align with more modern bedding sizes. Then I add cotton batting and cotton backing fabric and sandwich all the layers together with free-motion quilting. Finally, I bind the quilt with a double-folded binding for durability. I then wash and dry the quilt, as there is an expected 5% shrinkage of the cotton batting on the first washing and drying. The cotton batting is what gives my quilts the crinkly, vintage texture that I love. Some very pretty quilts end up on my sewing table, and I consider myself their temporary guardian or foster parent until they are finished, sold and shipped off to their forever homes. Then there is the quilt top that I purchased from an online shop in Indiana. When I opened the box, dust literally flew out of it and the pale pink quilt was so dirty that it looked gray. After a nice soaking in the bathtub (for three days), it emerged as a beautiful glorified nine-patch quilt that was hand sewn out of feed sack material. It was love and a complete foster fail. The finished quilt found a really nice new home, with me. 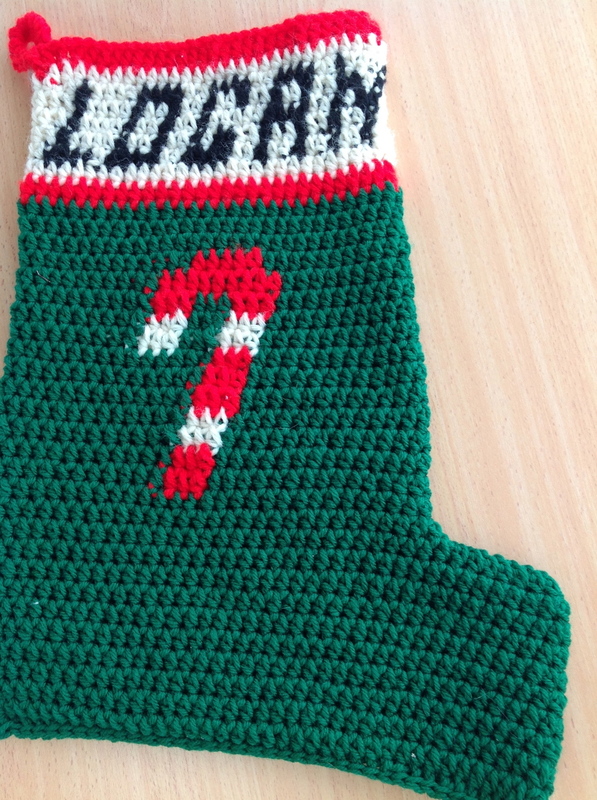 Have someone special that you would like to make a Christmas stocking for this year? I found this antique needle case (photo on the left) and recreated it (photo on the right). Here is my pattern and the directions for how to make one for yourself! In my latest Video Blog, I'm reviewing MacBroidery Software. It's a great way to add lettering to your machine embroidery designs!